NAGAPATNAM, India, (IPS) – Standing amidst his lush green paddy fields in Nagapatnam, a coastal district in the southern Indian state of Tamil Nadu, a farmer named Ramajayam remembers how a single wave changed his entire life. The simple farmer was one of thousands whose agricultural lands were destroyed by the 2004 Asian tsunami, as massive volumes of saltwater and metre-high piles of sea slush inundated these fertile fields in the aftermath of the disaster. On the morning of Dec. 26, 2004, Ramajayam had gone to his farm in Karaikulam village to plant casuarina saplings. As he walked in, he noticed his footprints were deeper than usual and water immediately filled between the tracks, a phenomenon he had never witnessed before. A few minutes later, like a black mass, huge walls of water came towards him. He ran for his life. His farms were a pathetic sight the next day. The Nagapatnam district recorded 6,065 deaths, more than 85 percent of the state’s death toll. Farmers bore the brunt, struggling to revive their fields, which were inundated for a distance of up to two miles in some locations. Nearly 24,000 acres of farmland were destroyed by the waves. Worse still was that the salty water did not recede, ruining the paddy crop that was expected to be harvested 15 days after the disaster. Small ponds that the farmers had dug on their lands with government help became incredibly saline, and as the water evaporated it had a “pickling effect” on the soil, farmers say, essentially killing off all organic matter crucial to future harvests. Plots belonging to small farmers like Ramajayam, measuring five acres or less, soon resembled saltpans, with dead soil caked in mud stretching for miles. Even those trees that withstood the tsunami could not survive the intense period of salt inundation, recalled Kumar, another small farmer. “We were used to natural disasters; but nothing like the tsunami,” Ramajayam added.Cognizant of the impact of the disaster on poor rural communities, government offices and aid agencies focused much of their rehabilitation efforts on coastal dwellers, offering alternative livelihood schemes in a bid to lessen the economic burden of the catastrophe. The nearly 10,000 affected small and marginal farmers, who have worked these lands for generations, were reluctant to accept a change in occupation. Ignoring the reports of technical inspection teams that rehabilitating the soil could take up to 10 years, some sowed seed barely a year after the tsunami.Not a single seed sprouted, and many began to lose hope. It was then that various NGOs stepped in, and began a period of organic soil renewal and regeneration that now serves as a model for countless other areas in an era of rampant climate change. One of the first organisations to begin sustained efforts was the Tamil Nadu Organic Farmers’ Movement (TOFarM), which adopted the village of South Poigainallur as the site of experimental work. The first step was measuring the extent of the damage, including assessing the depth of salt penetration and availability of organic content. When it became clear that the land was completely uncultivable, the organisation set to work designing unique solutions for every farm that involved selecting seeds and equipment based on the soil condition and topography. Sea mud deposits were removed, bunds were raised and the fields were ploughed. Deep trenches were made in the fields and filled with the trees that had been uprooted by the tsunami. As the trees decomposed the soil received aeration. Dhaincha seeds, a legume known by its scientific name Sesbania bispinosa, were then sown in the fields. “It [dhaincha] is called the ‘soil doctor’ because it is a green manure crop that grows well in saline soil,” M Revathi, the founder-trustee of TOFarM, told IPS. When the nutrient-rich dhaincha plants flowered in about 45 days, they were ploughed back into the ground, to loosen up the soil and help open up its pores. Compost and farmyard manure were added in stages before the sowing season. Today, the process stands as testament to the power of organic solutions. Poor farmers across Tamil Nadu are heavily dependent on government aid. Each month the state government’s Public Distribution System hands out three tonnes of rice to over 20 million people. To facilitate this, the government runs paddy procurement centres, wherein officials purchase farmers’ harvests for a fixed price. While this assures farmers of a steady income, the fixed price is far below the market rate. Thus marginal farmers, who number some 13,000, barely make enough to cover their monthly needs. After the 90-135 day paddy harvest period, farmers fall back on vegetable crops to ensure their livelihood. But in districts like Nagapatnam, where fresh water sources lie 25 feet below ground level, farmers who rely on rain-fed agriculture are at a huge disadvantage. When the tsunami washed over the land, many feared they would never recover. “The microbial count on a pin head, which should be 4,000 in good soil, dropped down to below 500 in this area,” Dhanapal, a farmer in Kilvelur of Nagapatnam district and head of the Cauvery Delta Farmers’ Association, informed IPS. But help was not far away. A farmer named S Mahalingam’s eight-acre plot of land close to a backwater canal in North Poigainallur was severely affected by the tsunami. His standing crop of paddy was completely destroyed. NGOs backed by corporate entities and aid agencies pumped out seawater from Mahalingam’s fields and farm ponds. They distributed free seeds and saplings. The state government waived off farm loans. Besides farmyard manure, Mahalingam used the leaves of neem, nochi and Indian beech (Azadirachta indica, Vitex negundo and Pongamia glabra respectively) as green manure. Subsequent rains also helped remove some of the salinity. 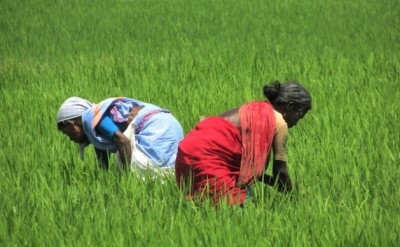 The farmer then sowed salt-resistant traditional rice varieties called Kuruvikar and Kattukothalai. In two years his farms were revived, enabling him to continue growing rice and vegetables. Read the full story via Organic Farming in India Points the Way to Sustainable Agriculture | Inter Press Service.